If you are a woman and you wear lipstick, then you have definitely had the unfortunate luck of getting it on your clothes. To make matters worse, you probably forgot to take your lipstick out of pants when you were washing your clothes and not there are huge lipstick stains all over clothes. Well, it turns out there is still hope in restoring the shirt to it’s once pristine condition with only a few products that contain no harsh chemicals. 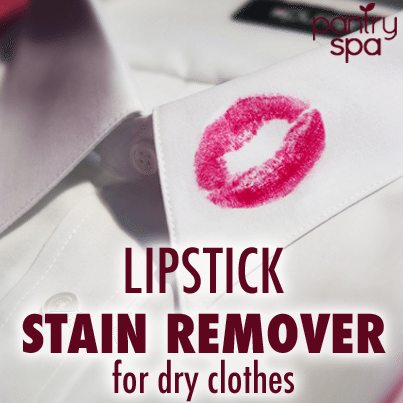 Check out both of the recipes for removing lipstick stains from clothing and let us know which one you prefer more by leaving us a comment below. Lipstick can be difficult to remove from clothing but it is possible to remove a lipstick stain with only some laundry detergent and rubbing alcohol. (Note: none of the ingredients have measurements because you might need to make a stronger or weaker batch depending on the stain. This recipe is for not too big or deep of a stain. If you need something stronger use more laundry detergent than the other ingredients and vice versa for lighter stains. Dab a cloth with some rubbing alcohol and laundry detergent and rub onto the lipstick stain. This may get out little lipstick stains with some scrubbing. For tougher stains, add a small amount of WD-40 to your laundry detergent and rubbing alcohol mixture. Let us know if you try this recipe on other stains as well. It might well for crayons and maybe even paint. Another great way to remove lipstick stains from clothing and even your carpet is Avon’s Skin So Soft. I know this is a beauty product, but it really works to remove some tough lipstick stains.